You may never have heard of him, but unless you're a complete stranger to the 20th century, you have almost certainly heard at least some of his music. 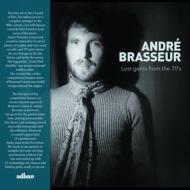 Andre Brasseur composed countless tunes that received plenty of airplay and were used as radio and TV music all over Europe in the late '60s and the '70s. His biggest hit, Early Bird Satellite sold millions internationally. This compilation focuses on a lesser-known aspect of Brasseur's musical output. In addition to his quest for the perfect intro tune, his innumerable live performances, and his management of several successful restaurants and discos, Brasseur recorded a great deal of experimental funky jams in the '70s. The most exciting and timeless of these lost cuts are compiled here - 13 enchanting cult classics and hidden gems, ready to devour. The second CD contains some of Brasseur's most successful evergreens and hit singles, exclusive to the CD format of the collection. Includes liner notes by Jan Delvaux (Belpop Bonanza). Two-CD version includes 32-page booklet.